Who’s more ‘clutch’? Tendulkar, Lara or Ponting? Who is the most clutch among these three legends from our generation? Given the somewhat sensitive title of the post, I tried to think of a lot of emotional, heartfelt introductory content but I failed miserably. But it suffices to say that these three players are the best from our generation, particularly in the ODI format of the game. A couple of folks (Ian Chappell and Nasser Hussain) have opined on who’s the greatest among the three ‘modern greats’. Honestly, it is a tough ask to rate the three for each is excellent in his own ways. I’m not here to ‘rate’ which one of them is the best among the three. What I’m going to address, is each batsman’s ability to perform in the clutch, which is one of the measures of a player’s greatness. After all, such performances tend to ‘define a player’s legacy’! I am going to compare (statistically), the performance of these three players under ‘clutch’ situations. They have played in the same era. They are all top order batsmen and have spent a vast majority of their careers batting in 1-4 spots in the batting order. I’m going to restrict this conversation to ODIs alone. ‘Clutch’ is defined as chasing a target. I will try to make things more granular as I proceed further. Only India, Australia, West Indies, Pakistan, New Zealand, England and South Africa have been considered for this analysis. Sorry Zimbabwe, Bangladesh et al. Only run chases are considered. The pronouns HE and HIS used in generic sentences encompass BOTH male and female human beings. Do not hassle me with ‘sexist’ and other epithets. Various images flash across our minds the instant we hear the word clutch. Like Michael Jordan’s buzzer beating “The Shot” against Cleveland (followed by Jordan jumping in the air and then throwing his elbows exactly three times after planting his feet on the ground), Javed Miandad’s last ball six off Chetan Sharma (I hate Nataraj pencils just for that) and so on. As far as ODIs are concerned, a clutch situation typically involves chasing a target. The pressure that is associated with chasing a target, particularly when two good, competitive teams are playing makes for good drama and excellent cricket. The players who shine repeatedly and consistently under such circumstances become legends of the game. The reason for emphasis on run chase will become clearer during the course of this article. These are obtained from Cricinfo directly after applying a filter for ‘fielding first’. Lara has scored nearly half his runs chasing targets! The ‘chasing average’ of all three players is pretty close to their career averages. This suggests that the pressure associated with a run chase doesn’t influence their performance significantly. In fact, Lara (on an average), scores 3 more runs during chasing. All players show the Jekyll and Hyde syndrome, i.e. elevated averages when their teams win during a run chase and reduced averages when their teams lose while chasing a target. It’s the extent of this syndrome exhibited by the three players that is quite intriguing. If we define Differential Chasing Average or D = Chasing Average during Wins – Chasing Average during Losses, it represents the degree of discrepancy in individual performance while a team goes on to win or lose. In principle, a ‘legendary’ player is expected to play the same way and produce at a high level regardless of the outcome of the game and the performance of other players on the team. So lower the D value, greater the degree of consistency of a player during run chases. The D values for Tendulkar, Lara and Ponting are 19.53, 40.11 and 39 respectively. Let’s pause and ponder over this for a moment. Taking Lara as example, when WI chases a total successfully, he tends to score FORTY MORE RUNS than when WI fails to chase a target. While an average of ~68 runs is fantastic during successful a run chase, that also indicates a lot of variation in performance. In other words, consistency is lacking. The same is true of Ponting (Differential = 39). However, the key difference between Lara and Ponting is that when their teams lose while chasing a target, Lara still manages to score a decent 27.5 runs, Ponting manages only 19 runs. Tendulkar, on the other hand, shows the least variation (D = 19.53). In fact, the variation is half of Lara’s and Ponting’s. This indicates more consistent performance during run chases. Lara has the best Chasing Average in Wins by a distance. He scores nearly 10 more runs than Ponting and 16 more runs than Tendulkar during successful run chases. Tendulkar has the best Chasing Average in Losses. It’s is about 13 runs or 67% greater than Ponting’s. He also scores 4 more runs than Lara during unsuccessful rn chases. Figure 1. Graphical representation of performance of Sachin Tendulkar (SRT, blue), Brian Lara (BL, Red) and Ricky Ponting (RP, green) during run chases. While the analysis so far has provided an indication of the extent of consistency of these players, it hasn’t truly separated them as to who is the best among the three. So I’ll up the ante a little bit and crank up the pressure. I’d like to evaluate these players’ performances under extreme pressure. In many cases, teams are chasing fairly small targets of 100 or 150. While the task is still challenging, it is not as daunting as chasing a larger target. Say 250. How do these players fare when chasing targets of 250 or above? The reason for choosing 250 becomes clearer when we take a look at how teams fare when they chase such targets. Get the ODI inning by inning list for Tendulkar on cricinfo. Set a filter for ‘fielding first’. Open every single match/scorecard and choose only those where targets of 250 or above were chased. Note the runs scored in each inning under two columns based on whether his team won or lost. Repeat the process for Lara and Ponting. Note that in Ponting’s case, a tied match is included for calculating chasing average. There is a LOT of collective failure! Just take a look at the W-L records. With these legends representing India, West Indies and Australia respectively, they have won ~30, 25 and 40% of their matches while chasing 250+ targets. The collective success rate is just 31%! So, if anybody tells you chasing 250+ is an easy task, just show him this table. Even the ‘invincible Aussies’, who have boasted some of the game’s premier batsmen, bowlers and perhaps some the most balanced sides ever, have failed to win even half the games while chasing 250 or above! Tendulkar’s average while chasing 250+ targets (39.9) is virtually same as his regular chasing average of 40.03. This is remarkable consistency. Lara and Ponting on the other hand, tend to score nearly 5 and 3 runs lower than their regular chasing averages respective, when chasing 250+ targets. Tendulkar also averages the most during 250+ chases. While Tendulkar and Lara are separated by one run, Tendulkar scores nearly 3 more runs than Ponting. The differential (D) values for Tendulkar, Lara and Ponting are 10.3, 34.2 and 46.6 respectively. Let me emphasize a bit more on the D values. Regardless of W or L, you can expect consistent performance from Tendulkar. Lara and Ponting, on the other hand, tend to play extremely well when their respective teams are winning, but tend to score poorly when their sides are on the losing side. This is particularly true of Ponting, whose average of 18.5 when the Aussies lose chasing targets 250 (probability is 26 out of 44 games or 59%) or above is quite frankly, poor! WI has lost 39 out of 52 games while chasing 250+. But even under these circumstances, Lara pretty much assures you 30 runs (chasing avg. during losses). Tendulkar, on the other hand, gets you 7 more runs than Lara and nearly 18 more runs than Ponting on days when your team is not doing a good job at chasing. This is a very significant difference in my opinion, given the fact that India and WI do not end up on the winning side often while chasing 250+ targets. But when their teams win, Lara and Ponting fire and fare much better than Tendulkar. This is clear from their chasing averages during wins. Figure 2. 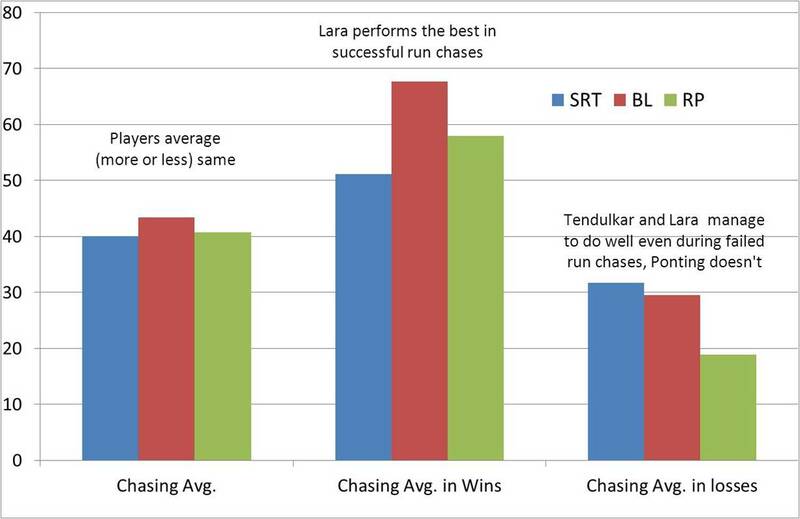 Graphical representation of performance during 250+ run chases for Tendulkar (blue), Lara (red) and Ponting (green). The bottom line is, no matter how high the pressure is, whether the game is being played on earth or elsewhere, no matter what kind of target the team is chasing, Tendulkar provides the most steady, consistent performance. Lara is a gambling man’s pick, while Ponting is (compared to Tendulkar and Lara) more of a hit or miss case. If snoring is a problem, you may need ZQuiet. 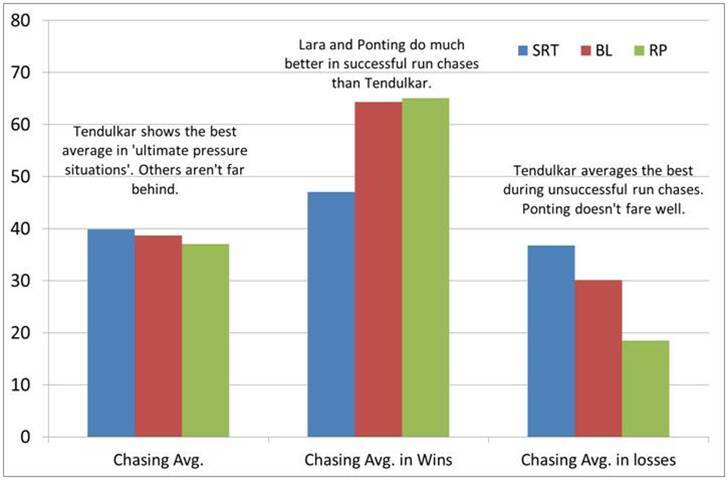 To me, this analysis puts Tendulkar and Lara a cut above Ponting. Particularly because Ponting has enjoyed the benefit of better overall teams than Lara and Tendulkar have enjoyed over their careers. But more importantly, the averages of 18.95 during unsuccessful run chases and 18.5 during unsuccessful run chases involving 250+ targets is something I wouldn’t call ‘stuff of legends’. In a nutshell, if I were to pick one of these three legends to help chase my team a target of 250 or above, which in my book, is a clutch situation given the rate of failure involved, I’d flip a coin. Heads – Tendulkar, Tails – Lara. Sorry Ponting, you just don’t make the cut on my list. Certainly not in ODIs. A day after India drew a Test match at Dominica against the West Indies, I still feel a sense of unease. Yes, a series win is a series win is a series win. However, I feel the same sense of disquiet and deflation that I felt after that 2007 drawn Test at The Oval against England. A few days back, when writing on Sachin Tendulkar in the context of the clutch debate, I wrote that I was not in favour of clutch being applied to an individual in a team sport. However, I am a fan of “clutch” for a team. A great team has to cease these moments. India failed her clutch moment at The Oval in 2007. In my view, the team completely by-passed a clutch moment again at Dominica. This team has been brilliant. Of that I have no doubt. I have sung the teams’ praises and paeans, just as anyone else has. I have been a vociferous supporter of this team. I am fan of this team. I have endured this teams’ vulnerabilities. I have tolerated her failures with poise. I have celebrated her recent successes with grace and dignity. I have been one-eyed about her failures. I have often been blind to her faults. In that period, I have been a vociferous supporter of the principle that Team India Fans should learn to put up with the teams’ faults; that fans have to learn to be patient; that fans have to give the team rope. But there comes a point in a team’s journey when the fan senses a clutch moment and wills the team to take that leap: A leap from being just ordinary, to being good, to becoming great. The point here is that India’s best victories have been back-to-the-wall victories. The Oval and Dominica presented the team with an opportunity to seize the moment, to make a difficult choice and become the enforcer at that point in time when opponents are sizing each other up. In my book, Team India was, instead, tentative. India opted for the soft option and did not become the enforcer. Great teams dictate the pace. And clutch moments like these become a habit. Just ask Rod MacQueen, former coach of the Wallabies and one of the most inspirational motivational speakers I have heard in my time. More on that later. There has been much written about the Dominica result already by Andy Zaltzman, Samir Chopra, The Cricket Couch, A Cricketing View, et al. Team India coach, Duncan Fletcher has defended the draw offer too. There are valid arguments in all of these pieces. All of these arguments are acceptable and accepted… I do have a bone to pick with the way Kartikeya Date makes the point in his conclusion, but to focus on chips and shoulders, would be to miss the forests from the trees. Let us just accept that all of these points are valid and move on. As Subhash Jayaraman says in his piece, this draw-offer has dominated social networking sites and online fora. He records that Twitter users have used labels and phrases like “Gutless”, “Wimps”, “Running with their tail between their legs” and such to describe the team. He continues that, “It is wildly inaccurate and highly melodramatic.” He also points to the melodrama of a Cricinfo commentary response that called the Dominica result “A black day for cricket”. I will be the first to admit that I was also a tad melodramatic in the manner in which I expressed my initial disappointments online. I take that flush on my chin. The more I see Rahul Dravid bat, the less I like the thought of him hanging up his boots/bat although it is, I know, inevitable. There are people who are comfortable with the draw offer and argue their point vociferously. I admire them. I accept their points. I am, however, not comfortable with the draw-offer. For me, a great team would have seized that moment. For me, greatness calls for the team to undertake such flights. And these aren’t flights of fantasy. The chase was difficult. If it were easy, you and I would have been playing the game! We were not and we are not. Bishoo was bowling a defensive line. If he was bowling trash, you and I would have smashed him for fours! We were not playing. And Bishoo was not obliged to bowl an attacking line either! For the record, I do not buy the ODI/T20 line of argument either that suggests “a run-rate of 4.5 runs-per-over is easy in a T20 game, so why not in a Test match?”. Those calculations matter diddly-squat in a Test match. My line of argument is actually quite simple. I am happy for it to be called simplistic too! Of the three results that were possible, a draw was the most probable result. I accept that. In my view, although an Indian loss was (remotely) probable, an India win was, it could be argued, more probable! And to support this argument, just take a look at the Windies’ bowling: If the West Indies thought they could win, why was Bishoo bowling a leg-stump line? I readily accept all the arguments that have been mounted in favour of Dhoni offering a draw. However, I have no no idea why he would not go for a win, however minimal the chances of success. A good team will take a 1-0 result. A great team ought to strain every sinew and aim for a victory with the tenacity of a pit bull terrier. I have aspirations for this team to take that journey and be a great team. Like Samir Chopra I will this team to “respond to [new] challenges”. If India had lost 3 wickets in 5 overs in the process of going for a win, do we really think that the West Indies could bowl this Indian team out and claim victory (in, say, 10 overs)? Remember that on the same pitch, Fidel Edwards had batted for a little over 2 and a half hours with almost no sign of discomfort! And finally, the fans… They had turned up in large numbers, for the first time in this series. Did the draw decision leave them short-changed? Yes. Are both captains to blame? Yes. Were the captains playing within the rules of the game? Yes, they were. But that is not my point. The fans had come to see an exciting finish. The team that was more in control will have offered the draw (assumption here). The team that had most to gain from the escape of a draw acepted it. The team faced a clutch moment. The team did not cease it. I am disappointed. Perhaps India wasn’t ‘ready’ at the Oval in 2007. As @sidvee put it in a Twitter conversation I had with him as the draw action unfolded: “Dravid had the weight of history to contend with in ’07…[ed. ]” Here in Dominica we did not seize it either! This is remarkably well constructed and put across in a seriously acceptable and emotional manner. It comes across as an honest and fervent plea, even to one who is still upset that the team stumbled at the altar of greatness. I accept the sentiments totally. Sporting teams and sporting cultures also fulfil one of the most basic of human needs – the longing to belong. Sporting clubs have some of the strongest brands in the world – fans want to be a part of the “team”. Think Manchester United, the Chicago Bulls, the All Blacks, or even the Sydney Swans. They provide an emotional connection between the people and the sport and supporters go to extreme lengths for their clubs. Yes there was hysteria. But perhaps the Team India fan has evolved! Today’s Team India fan wants more from his/her team. The fan has evolved. It is not merely enough for India to rock up on the park and make up the numbers! That India will. The fan knows that. It is not merely enough that India puts up a good show. Her fans know that India will do that. That is a given! It is not merely enough for India to make it a good fight. Team India fans know now that that will happen. Good teams do that. And Team India fans know that the team is good. The fan has evolved today. The bar has been set higher. The fan now wants India to play forceful cricket, attractive cricket, dominating cricket. This requires the evolution of a killer instinct that Steve Waugh’s team had. This requires the embracing of clutch moments like the one presented at Dominica. I am a fan. I just want my team to achieve. And in my view, not trying hard enough to achieve yesterday at Dominica was a mistake that must offer a new learning for all of us as we undertake this important journey along with our impressive team. Update: Dileep Premachandran completed his wrap of the West Indies series for The Guardian after the above post was written. Like many others, he has asked Keyboard Warriors (like me) to get a grip! A few months ago, Siddhartha Vaidyanathan (@sidvee) wrote an excellent article titled “Tendulkar and the ‘clutch’ question”. This was an exquisite essay, which recognized Tendulkar’s many virtues: his incredible longevity, passion for the game, hunger for the fight, impact beyond cricket, and his poise even when burdening a billion expectations. However, @sidvee’s article also states that Tendulkar’s performance in the “clutch debate remains partially unresolved”. Apart from this expression of thrust/hypothesis, one very minor gripe that I had with the article was that it was a somewhat convenient fence-sit, for most part. A “clutch moment” is defined as one where an athlete senses the moment, pounces on it and imposes his greatness on the occasion. The end result is normally a victory. This article was @sidvee at his very best. The arguments were excellently and passionately constructed. It even had a typo (“goosbumps” instead of “goosebumps”) to show us all that @sidvee was human after all. There were many comments from readers of this article. If the quality of an article is measured by the debate it generates, then this one certainly belonged in the top-drawer. There were also a few ripostes to @sidvee’s article; the best of these was one by Mahesh (@cornerd). At first I thought I would not buy into the debate, for a variety of reasons. For a long time now, I have employed a wicket-keeper for any arguments on Sachin Tendulkar’s greatness. Occasionally, I would find myself in the thick of a virulent debate on Tendulkar’s greatness. The main reason for staying away from the “clutch” debate, however, was that the Sachin-clutch argument was old-hat to me. It had done many a spin around my block! But then, I am not a great fan of a fence-sit either: a fence-sit gives the fence sitter nothing more than a sore bottom! So, I have decided that, after nearly three months, I will weigh in to the debate after all. In a subsequent piece, @sidvee quoted from Stephen J Gould’s brilliant piece on Joe DiMaggio’s phenomenal 56-game hitting streak, in which the author comments on the nature of legend. The argument is that Tendulkar’s peers — Ricky Ponting, Shane Warne, Steve Waugh, Brian Lara, Adam Gilchrist, VVS Laxman, Rahul Dravid, Aravinda De Silva, et al — have faced and seized clutch moments. These moments have been recorded and recognized in their respective CVs. Meanwhile, the argument is that Tendulkar let his clutch-moments slip through his fingers. Indian cricket fans will point to the fact that if India had won the Chennai Test against Pakistan in 1999, we may not have felt the need to have this argument. Tendulkar would have had his clutch moment on his CV. That moment would have been further augmented, ornamented and romanticized by virtue of the fact that Tendulkar battled through an injury to get India to within spitting distance of victory in that Test. We like blood. We like our sporting heroes to be gladiators that vanquish evil. The clutch is a much better clutch if the sportsman has morphine in his body or his jaw strapped by a bandage. We willed Tendulkar to win that match for us. But he let us down! Tendulkar got out within sight of victory. India lost. The Indian cricket fan has not forgotten! When we turn our focus on that heroic-tragic Chennai Test against Pakistan that India lost, few fans seem to remember that it was a low scoring match; that no team had crossed 300 in that match; that apart from Afridi, who had scored a second-innings century as opener, no other player stamped his authority on the game; that Saqlain Mushtaq bowled as brilliantly as anyone has seen him bowl; that the pitch was crumbling; that at 82 for 5 chasing 271, India was cooked already! It was against this backdrop that we must see Tendulkar’s epic effort. I do not wish to be a Tendulkar apologist. That is not his point. His record speaks much more than I can. However, the point I wish to make is that the scorecard does not record the above details. 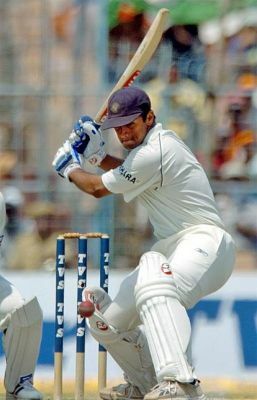 The scorecard does not record the fact that Tendulkar first shielded and then battled Nayan Mongia through an epic contribution; often chiding him for taking undue risks; always encouraging him. Worse! The scorecard does not record the fact that, with 53 runs to get, Mongia departed to an ugly pull off Wasim Akram! By getting out, Mongia had said (like almost all Team India players of Tendulkar’s era had), “You do it on your own from here. I am out of here!” The scorecard does not record the fact that Tendulkar was in severe pain at that point in time. His back had given way by then. The scorecard does not record that, despite that pain, he chose to change gears and belted a few boundaries once Mongia got out (needlessly). The scorecard also does not record the fact that all it took was one single fatal miscalculation; one small error of judgment is all it took for Indian fans to label him permanently as a clutch failure! The scorecard does not record the fact that, when Tendulkar departed at 254, with 17 runs still to get, the Karnataka quartet of SB Joshi, Anil Kumble, Javagal Srinath and Venkatesh Prasad could only get 4 between themselves! The fact that the Karnataka quartet disgraced themselves is forgotten. The fact that they collectively devalued Tandulkar’s efforts to get India to that point is also forgotten. The point is that “clutch” is a difficult concept in cricket. It ignores the team. It ignores Nayan Mongia and the Karnataka quartet. It is agnostic to contributions (or lack thereof) from a team. It is a uni-dimensional and harsh measure. As @sidvee himself points out, it is impossible to compare greatness across different sport or indeed, different players in the same sport who play for different teams and in different eras. It is precisely because of this that I value Tendulkar’s centuries more than I value Ponting’s centuries; Ponting did not have to face McGrath, Warne and Gillespie! Clutch applies perfectly only to tennis players and golfers! They chart their destiny themselves. Almost exactly a decade later — one month shy of a decade later — Tendulkar chose the same venue (Chepauk, Chennai) to “atone” for his earlier inability to close out a win. He stayed not out till the end, scored an unbeaten century and ensured that India won against England. This was an important win for the country’s pride, leave alone the team! This win emerged from the shadows of the 26/11 tragedy that had shocked a nation. I am told that there was not a dry eye in Chepauk. This could have counted as a clutch. But even this was contribution was not enough. I suspect that most Indian fans are still not able to forgive Tendulkar for that 1999 game. As one reader said on @sidvee’s blog, Tendulkar constantly gets the short-shrift. We are quick to make Gods out of mere mortals, but we have a constant need for our legends to be nothing short of Gods — all the time. I am not a big fan of “clutch” in team sport. It is all too individualistic. Even Roberto Baggio does not qualify as a clutch failure in my books. Yes, he fluffed that penalty shoot in 1994. But that ignores his teammates’ many misses during the game. I am not in favor of tagging transient acts of excellence as “clutch” in a team sport. If we did, we run the risk of calling Ajit Agarkar or David Warner as cricket geniuses (the logic here is that clutch suggests genius)! By the same argument, I am not in favor of tagging transient acts of lack-of-excellence as “clutch failure” in a team sport. As Mahesh (@cornerd) says in his riposte, Tendulkar’s preparation for the 1998 series against Australia constitutes “clutch” to me. To me, clutch in a team-sport is not a specific instance in time. It must be demonstrated through sustained acts of (heroic) excellence for it to be a clutch. And Tendulkar certainly has these sustained acts of excellence in his CV. The above post as [mohankaus], [blogesh], [sanjaysub], [smangalam] and [ajit_bhaskar] respectively. Read more about the contributors to this blog here. If you would like to submit an article, please send it by email to one of the Contributors. We will review your submission and, if appropriate for this blog, i3j3Guest will post it. We will, of course, sign the article under your name. I don’t want 2-Test series. Dear Cricketers, Talk More. Please. Whose resource is it anyway? Mohali – Better and Worse than I thought. IPL-IV: Uncapped Players or Drafting Rules Without a Thinking Cap? New Windows Azure datacenters in Oz. Finally!! !